The vision of Thomson Park became a reality when we achieved our goal of installing and dedicating it in June 2011, the 235th anniversary of the Battle of Sullivan’s Island. We have continued researching details of the battle and expanded the park to include benches, a bike rack, a fourth exhibit, and a sign recognizing contributors. Progress is posted here for our community of supporters. Email dougmac@mindspring.com if you would like to be a Friend of Danger and receive the updates directly by email. Supporters of Thomson Park are “Friends of Danger”. 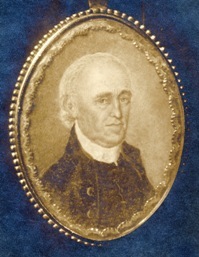 Colonel William Thomson (1727-1796) was responsible for thwarting the British attack across Breach Inlet in 1776. His troops affectionately called him “Danger” in tribute to his bravery and daring in battle. Thomson was said to be the best marksman in the backcountry – any enemy he could see was in danger. He doesn’t look so tough in this portrait from about 1790. Of course, he was 63 years old and dressed up for his friends. Click the links below to read the documents. This is so cool! I will definitely be visiting the next time I am in Charleston.